On 14 January 2019, a Boeing 707 operated by Saha Airlines on a cargo flight crashed at Fath Air Base, near Karaj, Alborz Province in Iran. Fifteen of the sixteen people on board were killed. The aircraft involved was a Boeing 707-3J9C, c/n 21128, registration EP-CPP. The aircraft was owned by the Islamic Republic of Iran Air Force and had been leased to Saha Airlines. The aircraft was 42 years old at the time. The aircraft had first flown on 19 November 1976 and was delivered that month to the Imperial Iranian Air Force as 5-8312. It had been transferred to Saha Airlines on 27 February 2000 and was re-registered EP-SHK. It was substantially damaged by an uncontained engine failure on 3 August 2009 whilst on a flight from Ahvaz International Airport to Mehrabad International Airport, Tehran. An emergency landing was made at Ahvaz; the aircraft was subsequently repaired. It was returned to the IRIAF in December 2015 and returned to Saha Airlines in May 2016, registered EP-CPP. The aircraft was on an international cargo flight carrying meat from Manas International Airport, Bishkek, Kyrgyzstan, to Payam International Airport, Karaj, Iran. It was reported that the aircraft made an emergency landing at 8:30 am local time at Fath Air Base, 10.9 kilometres (5.9 nmi) to the south-east of Payam, with some sources suggesting that the aircraft landed there in error. A 707 generally requires a runway length of more than 2,500 metres (8,200 ft), but the runway at Fath Air Base is only 1,300 metres (4,300 ft). Poor weather conditions were also reported. The aircraft overran the runway, crashed through a wall and came to rest after colliding with a house in the neighborhood of Farrokhabad, Fardis County, Alborz Province. The houses involved were empty at the time of the crash, and no one on the ground was injured. Following the crash, a fire developed. Early reports gave the number of people on board as either sixteen or seventeen (one a woman), all but one of whom died. The sole survivor, the aircraft's flight engineer, was taken to Shariati Hospital in critical condition. In a possibly related incident from 16 November 2018, a Taban Airlines MD-88 carrying 155 people twice attempted to land on this runway, mistaking it for the longer 3,659-metre (12,005 ft) Payam runway, which is nearly inline. On first approach the plane reached an altitude of 1 metre (3.3 ft) before aborting the attempt, but eventually continued on for a safe landing at Payam after an aborted second attempt at Fath. An investigation was opened into the accident. The cockpit voice recorder was recovered from the wreckage on 14 January. The flight data recorder and the Control Display Unit were also recovered. ^ a b Hradecky, Simon (14 January 2019). "Crash: Saha B703 at Fath on Jan 14th 2019, landed at wrong airport". The Aviation Herald. Retrieved 14 January 2019. ^ "EP-CPP hull-loss occurrence". Aviation Safety Network. Retrieved 14 January 2019. ^ a b c d Livingstone, Tom (14 January 2019). "Flight engineer survives Iran plane crash". Channel Nine News. Retrieved 14 January 2019. ^ "EP-SHK non-hull loss occurrence". Aviation Safety Network. Retrieved 14 January 2019. ^ Mitchinson, James, ed. (15 January 2018). "Ageing military cargo jet crashes, killing 15". The Yorkshire Post. p. 10. ISSN 0963-1496. 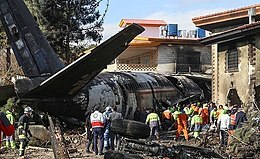 ^ a b "Boeing 707 cargo plane crashes near Tehran, claims 16 lives". Tehran Times. 14 January 2019. Retrieved 14 January 2019. ^ "Iranian Army Boeing-707 Crashes Near Tehran, 15 Killed (PHOTO, VIDEO)". Sputnik News. 14 January 2019. Retrieved 14 January 2019. ^ "Aircraft Runway Requirements". Retrieved 15 January 2019. ^ "Measured from Google Maps". Retrieved 15 January 2019. ^ a b c d e "Iran cargo plane crash 'leaves 15 dead'". BBC News Online. 14 January 2019. Retrieved 14 January 2019. ^ a b "Bodies of 10 victims of plane crash identified". Islamic Republic News Agency. 14 January 2019. Retrieved 14 January 2019. ^ "ASN Wikibase Occurrence # 219603". Aviation Safety Network. Retrieved 17 January 2019.